LE TAUX HEBDOMADAIRE D'ETE EST SEULEMENT 1855 $. Notre prix de location comprend: la location, les taxes et le nettoyage! S'il vous plaît noter: Ceci est une location de vacances axée sur la famille, et nous avons une politique «30 ans et plus» pour nos locataires. CONSTRUCTION NEWER! - Frais, propre et vierge. Nouvellement REMODELED avec nouveaux comptoirs en granit, évier, robinet, dosseret, plancher en stratifié et laveuse / sécheuse. Mobilier de poterie amélioré. Nouvelle douche extérieure fermée avec passerelle en bois à la porte. Cette maison de vacances comme neuf a le meilleur de tout. Emplacement, emplacement, emplacement, à quelques minutes à pied des plages familiales protégées par le gardien de la vie (5 minutes). Ce trois chambres, deux oasis de bain dispose d'équipements à gogo, y compris une cuisine entièrement fonctionnelle avec bar. Il y a la climatisation centrale et de nouveaux meubles. Profitez de cette maison de vacances équipée d'un accès Internet sans fil, de télévisions à écran plat (2), d'un lecteur DVD, d'une chaîne stéréo, de jeux et de livres pour le plaisir de tous. Nous avons une douche extérieure chaud / froid, panier de plage, chaises de plage, parasol, vélos, etc. Il ya une belle terrasse avec costauds colonnes porche blancs. Profitez de nos tarifs avantageux !!! Nous fournissons également de nombreux produits de base tels que des produits en papier (assiettes, serviettes de table, serviettes en papier, serviettes, etc. ), une armoire à épices bien garnie, des condiments, un grille-pain, une plaque chauffante, une cafetière, un mélangeur ninja, etc. magasin vous permettant de passer plus de temps sans stress avec votre famille et vos amis. Les vélos sont disponibles pour nos clients. Des chaises de plage sont également incluses - assez pour votre famille entière. Un parapluie, des jouets de plage et un chariot de plage IMPRESSIONNANT avec des pneus de plage pour rendre le voyage à la plage un jeu d'enfant. La chambre principale a un lit Queen et salle de bain privée complète. Une chambre d'hôtes dispose d'un lit Queen et l'autre chambre a deux (2) lits superposés (4 lits jumeaux). Il ya une deuxième salle de bain complète facilement accessible par les deux chambres. Il y a aussi une buanderie avec une nouvelle laveuse et une sécheuse. La maison dispose d'un paysage tropical avec des palmiers matures et accents de pierre lavés. Il ya aussi un garage plein de taille. Nous louons samedi (entre 15 heures après) au samedi (départ avant 10 heures pour permettre le nettoyage). Aussi, si vous avez besoin d'un agent immobilier lorsque vous êtes en ville, nous vous recommandons Joe Hanselmann à Wilkinson and Associates Real Estate. Il peut être contacté à 910-297-2222. Joe est un bon gars qui sait vraiment la région et marché du logement extrêmement bien. Wonderful facility. Great extras. Great location. Everything was great. Facility, amenities, location!! Thanks so much for taking the time to write a review. We strive to provide a worry free home away from home by ensuring a very clean, comfortable environment for our guests. We believe includes ng paper products, tp, napkins, trash bags, etc. helps get your stay off on the right foot. Relaxing home away from home! The house is well equipped with anything you need! From bikes to umbrellas and sand toys, this house really has it all. Walter and Lois communicated very well and were super nice. There was more than enough space for all of us to hang around while it was raining and things to do nearby. Would highly recommend to anyone coming to Kure Beach! Thank you again! Thanks so much for taking the time to write a review. We try to provide everything we think you'll need (except sheets and towels) to make your stay as worry free as possible. Our intent is to provide a clean, comfortable home away from home so you can relax and focus on making memories with you Family and Friends. The house was perfect!! It was very clean and all the staples the owners provide makes packing easy! It was a short walk to the beach and the wagon that was there for our use was awesome! My family also loved the bikes!! Such a fun weekend and the price was unbelievable!! We will definitely be back! The owners were wonderful to work with. Thanks so much for take ng the time to write a review. We work very hard to keep our place clean and comfortable. Also, by providing lots of basic supplies helps to make you stay stress free. House was immaculate- well stocked kitchen, very easy to communicate with owners! The house was in a great location- walking distance to beach! Thanks for taking the time to provide feedback. We strive for a clean, comfortable, stress free stay for our guests. The new renovations and providing paper products (paper towels, plates, napkins, TP, etc.) should make your stay easier. Of course, walking distance (<5 min.) to beach doesn't hurt :-). We had a relaxing stay at the newly updated, very clean, organized and beautifully appointed Seawatch. Walter & Lois stayed in close contact with us to make sure we had everything we needed before and during our family vacation in Kure Beach. The kitchen had everything we needed (good pots, pans, knives, etc.) to cook breakfast or dinner for quiet evenings in. The porch and Adirondack chairs there were well used....such a nice, sunny spot to enjoy morning coffee or an evening cocktail! The neighborhood was quiet and enjoyable to take the bikes out for a ride, and the beach access is literally around the corner - maybe a 5 min. walk. Neighbors were super friendly. Having a variety of sizes of bikes to choose from, sand toys for the kids and a beach buggy for transporting everything to and from the beach were really nice additions. 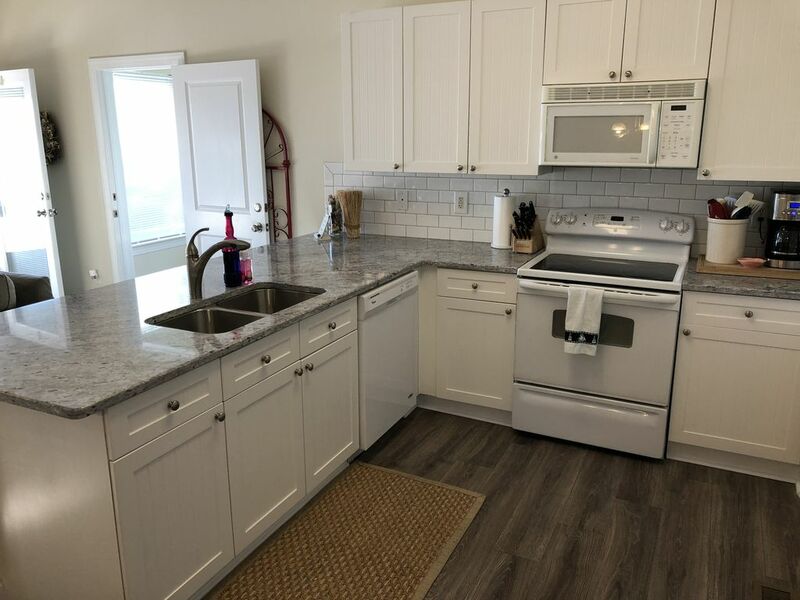 I can't say enough about how clean the condo was, and how easy to keep it clean the owners make it by providing all of the supplies they do (cleaning solutions, swiffers, mops, brooms, good vaccums). We will definitely be back in the future! Thanks for a lovely stay, Walter & Lois! Thanks so much for taking the time to write such a thoughtful and thorough review. We're glad to hear you enjoyed our renovations and the cleanliness / convenience of our furnishings and content (pots, pans, paper products, etc.). We work hard to ensure our place is clean, comfortable and relaxing for your stay. If you have problems with noise from upstairs in the future, please contact us and we'll address immediately with the owners of the upper unit. the house was a great place to hang out with friends for a long weekend. We really enjoyed everything about the vacation rental. Comfy beds, stocked kitchen and relaxing living room. Thanks for taking the time to provide feedback. We're happy you had a great time and found our home comfortable, clean and providing a relaxing environment. Please visit us again!